When I signed up for the Mermaid East Bay Run many moons ago, I planned on doing their debut 18-mile race, called the Sirena18. But when my IT band started acting up a month ago, I knew that would be a poor choice, so I changed my race to the Half Marathon. I have the San Francisco Marathon coming up at the end of July (the full 26.2 miles), and keeping that training on schedule has been most important ~ I figured, if I had to run a shorter race to stay strong and injury-free, then so be it! So for the last month, I tapered my runs, got a bunch of acupuncture, Qi Gong, and bodywork, reinstated my lower-body strength training, and practiced Yin Yoga to open up my hips. I also topped off my runs at 5 miles max. But on Friday, I got nervous about running a Half. I was sure I could do it, but I was afraid that 13.1 miles might push it too long. And you know what? Heading into a race with fear is NOT something I ever, ever want to do! I race for fun and for fun only. So! The 10K it was! I crashed early on Friday, knowing I’d have to get up very early to drive to Fremont (an hour away), so I could change my race without having to wait in some huge line. So I was up at 5:15. Breakfast was a 2-egg omelet with mozzarella and spinach and a cup of coffee. Made it to the park just before 7:00 and had NO trouble at all changing to the 10K. Kudos, Mermaid team! Rebecca and I met up around 7:30, and spent some time getting photos and browsing (shopping!) the expo. Fortunately, the parking lot was right there, so I was able to go back and forth to my car easily. SO convenient. At 8:15, I took some warm-up laps around the parking lot, then ate two date-and-coconut rolls for pure energy, and joined the crowd to line up. It was fun to have Rebecca there to chat away the nerves before the starting gun! My official final time was 55:01, a pace of 8:52/mile! The 10K started at 8:30AM, out of the parking lot and around the lake area on a gravel path that eventually turned to trail. I made sure to start off slow, so I could have negative splits ~ that is, so my miles would gradually gain speed instead of the other way around! For the first mile, I focused on warming up and finding a pace I felt comfortable at. I also adjusted to running on the gravel, which was quite a bit rockier than I was expecting. My leg felt fine, as it usually does for the first mile. 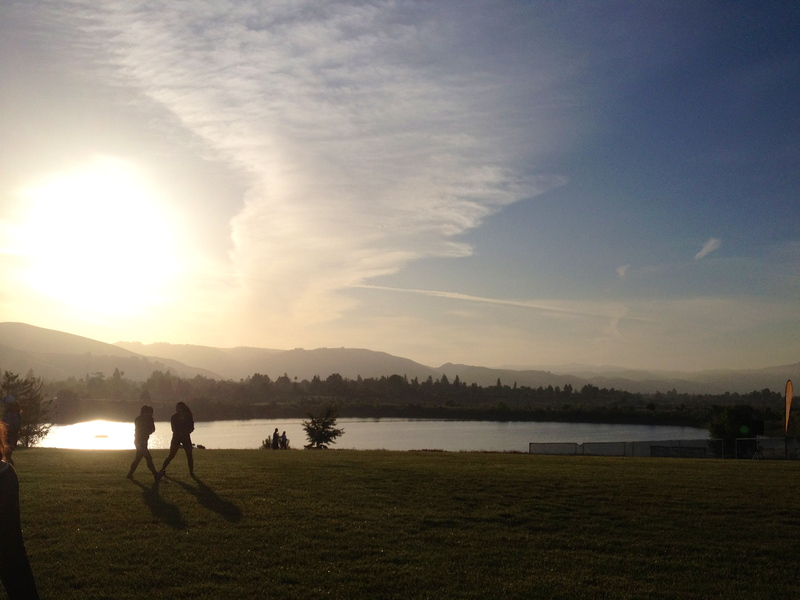 By the second mile, I had found a rhythm and started to relax, watching the other runners and the scenery. The gravel had thinned out and became much easier to run on. I felt physically comfortable and strong. Around mile 3, we had some nice shade. Runners and walkers from the Half and the Sirena18 were passing on their way back, which made for good people-watching while running. Not much longer after that, we had the turnaround. I’d stopped at three water stations already and decided just one more. I was feeling really happy and the route was mostly flat and speedy. Miles 4-6, I paced behind three women who were running a tempo I enjoyed. Near mile 5, I passed one of them and felt an extra surge of strength. I was also happy to notice that my leg and hip were not bothering me at all, and so I felt comfortable pushing just a little bit faster. Near the mile 6 marker, I passed another one of the 2 pacers, and caught up with the third. At a mile to go, I decided to sprint. I could see the finish line and when I could hear the announcers, I told myself to just push it, that it was almost over, and to just all-out do the fastest I could. Of course, the final portion was uphill! Why do race planners do that?? 🙂 Nevertheless, I kept at it and pushed nice and hard. I had just rounded the final bend when I heard, “Andrea!” and looked down the hill to see Rebecca making her way toward the finish line, also! It’s amazing how much energy hearing your name can give you. I bolted toward the finish line and crossed it feeling happy! Only a few minutes later, Rebecca crossed it also, and we were done! 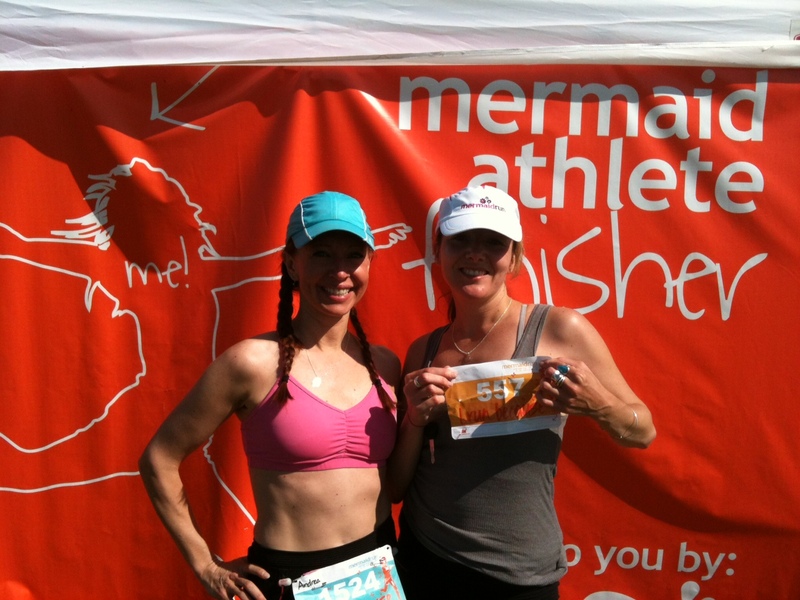 Me & Rebecca: Mermaid Athlete Finishers! All racers got an adorable silver finisher’s necklace: a small circle pendant with the Mermaid Series “M” logo on one side and “inspire” on the other. 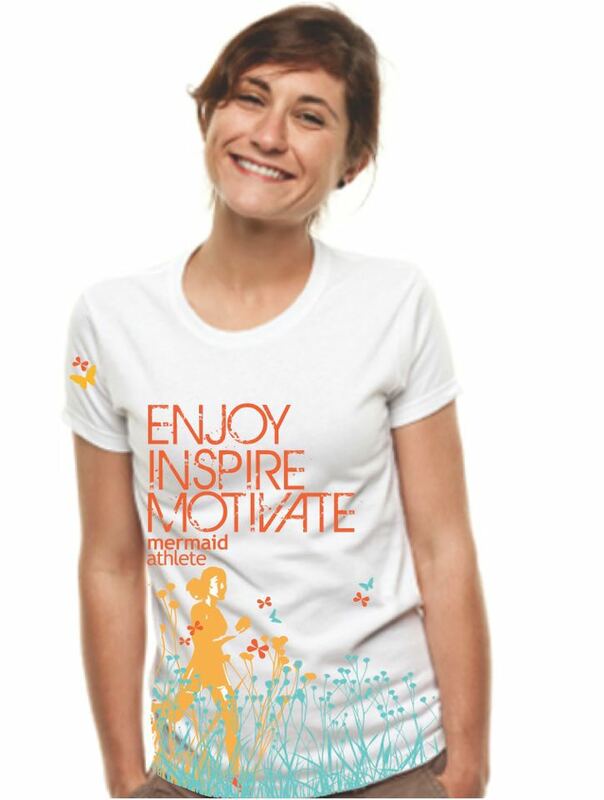 We also got this T-shirt, which fits perfectly and is super-cute, to boot. The expo was great. In classic Mermaid style, they had a photobooth set up, where you could get pictures wearing boas and holding personalized signs. Not only could you print the photos right away, they also had a station set up where you could Facebook and Tweet the photos right away, too! And, of course, they had all the great Mermaid schwag for sale: hoodies, T-shirts, hats, jewelry. Although I knew I’d be getting my finisher’s necklace after the race, I couldn’t help but also buy an adorable “Run” necklace before my run. Sterling silver and will keep me inspired! After stretching it out, Rebecca and I skipped the post-race pancakes and headed into nearby Union City for a super-long, lazy, chowdown at a local greasy spoon called Baldie’s. I think we were there for, like, 3 hours. In sum, I’m very, very happy I decided to do the 10K. I’m confident I could have done the Half, but as I’ve said, at this point in my marathon training, it’s most important to stay fit and strong, and the Half simply would have been too big of a risk. I felt prepared and well-trained for the 10K, which boosted my confidence a lot. As always with these races, I’m so grateful for my hilly routes around here. It makes the small hills in other parts of the Bay Area seem FLAT. I keep this in mind as I huff and puff through them every week, knowing they are great training grounds. But mostly, I am really grateful for feeling GOOD. I’m grateful that my leg is better and that I have the confidence again to return to adding mileage to my training. And perhaps most important, I’m way less nervous now about the marathon and am back to having excited butterflies, instead! Way to go Andrea! Sounds like the 10 was a good call and you look cute as punch at the start line! Aw, thanks! The 10 was definitely the right choice! I feel great today.